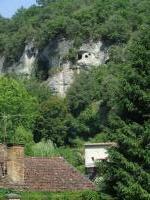 Decorated Grottoes of the Vézère Valley is a complex of caves in southwestern France famous for its cave paintings. They contain some of the most well-known (Upper Paleolithic) art, dating back to somewhere between 15,000 and 13,000 BCE. They consist mostly of realistic images of large animals, including aurochs, most of which are known from fossil evidence to have lived in the area at the time. If you are spending time in the department of Dordogne, it is possible with the right planning to see 3-to-5 locations of this WH site in one day. My day in May of 2018 started with a wash. Grotte de Font de Gaume is among the most popular of the caves. You cannot buy tickets in advance, and only 50 people are allowed in during the course of the day. The caves open doors at 9:30am, and you realistically need to be there no later than 8:30 in order to get a ticket for some later time in the day. We arrived around 9:05 and were approximately at #70 in line, and left at 9:30 after hearing from the ticket clerk that our chances for the day were slim. I knew in advance that there was a fair possibility of that happening, but getting up much earlier to spend an hour or more in line for tickets is rarely an acceptable strategy for yours truly; I was hoping that in the shoulder season there may be less competition for tickets, but was proven wrong. Instead, we went to Abri de Cap Blanc, where there was no line for the opening at 10am, and only a dozen of other visitors joined us in the following hour. This is not a cave, but a preserved rock overhang (abri means "shelter" in French), where the art form is not painting but sculptural relief. The sculptures were magnificent beyond any of my expectations. The small onsite museum has a few artifacts, exhibits, and replicas related to the primeval residents of the valley. Access to the actual sculptures is allowed only in small groups with a guide. The guided tour is in French only, but an English-language information sheet is available. We next went to Grotte de Rouffignac, where it is possible to just walk in and get on the next tour of the cave. The electric tourist train goes almost two kilometers deep inside the cave, taking you to a series of monochrome drawings and engravings of various animals, dating from around 13,000 years ago. Interestingly, the guide stresses the fact that the cave was never really inhabited by the humans, and there is no good answer as to why people traveled so deep inside the dark passages to leave their artistic mark on the walls and the ceiling. The tour is in French only, but when enough English speakers are present the guide will occasionally switch to English. Companion electronic guides, with texts and pictures in various languages, can be rented at the ticket office for the duration of the tour. Our final stop was Lascaux, the headline site of this World Heritage series, where a huge modern interpretive center (named "Lascaux IV") was built a few years ago to cater to the masses. Everyone who tours Vézère prehistoric sites comes to Lascaux; buying tickets online in advance is highly recommended, although I expect that in low season you can probably walk in without an advance purchase. English-speaking tours are scheduled only a couple of times a day, while French-speaking leave throughout the day every few minutes or so; I did not find the guide's commentary widely illuminating, but she did point out a few more obscure features of the paintings, so planning for the English tour may make sense for those who do not speak French. There are no real caves at Lascaux IV (the original cave is located some distance away and has been closed to visitors for decades; a secondary cave - Lascaux II - can be visited with a French guided tour on very limited schedule). Your visit to the interpretive center will take you to the replica of the caves, and then your guide will deposit you at "the Studio", where you can explore the paintings and the history through many interactive exhibits. There are also a series of short movies related to the discovery of the caves and the interpretation of its art, as well as an exhibition of modern art inspired by the primeval paintings. The reproductions of the Lascaux paintings - make no mistake, you are only seeing reproductions here - are polychrome, and almost too vivid to bring suspicion of not being authentic. But all available information suggests that the original paintings indeed remained in similar brilliant shape for millennia until their discovery in mid-20th century. I used to think that primeval art was not exactly my cup of tea, but I am very much impressed with what I saw at the Vézère sites. Majority of the sites are located no further than 30 minutes by car from either Sarlat or Perigueux. They are not managed by a single outfit and they all have different access policies, so advance research is paramount. 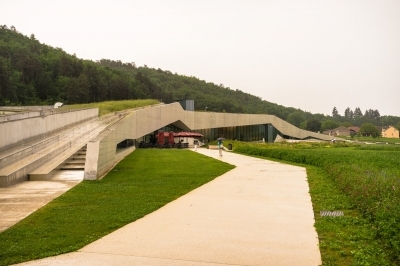 When I heard that France would have opened the new Lascaux International Center known as Lascaux IV, I immediately wanted to visit this new museum which seemed to be a great place to see. The tickets are easy to secure by online booking from the Lascaux’s website (which could be improved a lot) even if not all guided tours are on display, but since my visit happened last week (September), there were plenty of free slot of tour to choose. They cost 16€, a remarkable price I should say. The village of Montignac is easy to reach only by car though. As other people said, the museum complex building is modern and well integrated with the nearby landscape. Professional guides accompany groups of max 32 persons (commencing every six minutes) from the site’s welcome desk to the exit of the reproduction of the cave. After being guided to the roof in the open air to explain the environment of Vezere River Valley, listening to a dog barking sound and voice of chasing boys to replicate the time when they discovered Lascaux in a small open corridor next to the forest, seeing a presentation of what this area looked like in ancient time, we finally entered a kind of replica of Lascaux Cave. Inside the replica, the atmosphere is like a real cave. It is cool and dark. They say this space is dedicated to “contemplation”, so, even if you are staring at replicas you are not allowed to take any picture even without flash, which I found exaggerated for our “image society”! After that, you go by yourself to the multimedia part of the museum, the Lascaux Studio where eight large walls of the cave are reproduced separately, with a kind of IPad. To tell the truth, I expected much more, both from the cave replica and the museum itself. The iPad is not immediately comprehensible and many explanations are poor. 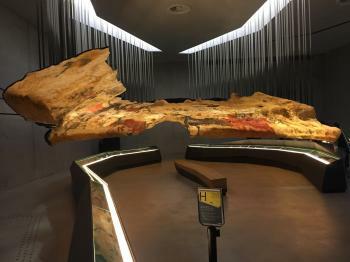 If you had not been at Lascaux II, you don’t realize what has been added in this new museum, no plan of each site (I mean, the real Lascaux, Lascaux II and IV) is on display to better undestand where you are nor a complete video of the real Lascaux is projected. There’s a huge waste of space in a three-room cinema with beautiful images though. When I came back home I found out on their website there was a 3D cinema but I didn’t see it once onsite!! If it really was on offer, it means it was not signalled properly, since I stayed there 3 hours and visited every corner, nor the guide suggested us to go and see it. So, if you go, try to not miss it like me. I liked a VR video at the very end of the visit but it was very short and provided only a ride in the first big cave. Finally, don’t buy gourmet souvenir at Lascaux International Center because they cost the double you can find outside. If you really want to see a spectacular real cave with beautiful and interesting prehistoric remains, go to Pech Merle cave in the Lot Valley. It’s not a Unesco site, but it’s incredible. The guided tour (I think only in French) lasts 1 hour, which is a little bit too short but ok; no photos are allowed and here you really will regret this rule since the cave is magnificient not only for it’s paintings but also for it’s huge and special stalagmites and stalactites formations. Read more from Monica Tasciotti here. When I heard the news that France has opened the new Lascaux International Center or commonly known as Lascaux IV, I immediately asked my friends to visit this new museum as part of our trip to Andorra which seemed to be a great place to see. The tickets were very easy to secure by online booking from the Lascaux’s website and maybe our visit was happened in March, there were plenty of free slot of tour to choose. We arrived the village of Montignac 50 minutes before our tour started, but because of many detours from road construction in the center of village and our GPS did not know this new site, we got lost and arrived at museum carpark 10 minutes before the tour started. The stunning museum complex building is very modern but well integrated with overall nearby landscape. We met our guide who is excellent in French accent English. Our tour group was only 10 persons. The museum also provide an excellent hi-tech audio guide with personal ipad liked machine. First of all our guide took us to the roof of the complex to explain the environment of Vezere River Valley, then we went to see a presentation of what this area was looked like in ancient time in each seasons especially the common wild animal and the story of how Lascaux has been rediscovered by local teens. Our guide took us to the small open corridor next to the forest while played the record of dog barking sound and voice of chasing boys to replicate the time when they discovered Lascaux. Then came the highlight of the tour, the replica of Lascaux Cave. The replica is stunning for its impressive works of multi-colored of art, the images of the rows of countless animal by ancient humans in the first and second rooms are really beautiful, while it was unbelievable that all are just a replica with faithful works to copy everything from the real cave. Then we went to see the new section that was not at the Lascaux II, so this section was quite interesting for people who already been to Lascaux II. While there are still a lot of paintings in this new section, most of them are lack of color, only fainted lines are visible, so without guide, this section really looked plain. After that the guide took us to another hall which display partial sections of paintings which we could see as long as we want for better understanding via the audio guide and multimedia. Then we went inside cinema hall which displayed history of Lascaux interpretation and study and ended the tour with nice meal at café museum. Lascaux International Center is a very nice place to visit, the first and second hall of the replica are unbelievable and very beautiful. The display which try to make a better understanding on cave study and history is really good and highly recommended, truly one of the best World Heritage Site of France. What is our opinion on Lascaux IV, I think what our guide said before we entered a replica cave is the very good summary “Human love beauty and in searching of beauty is a thing of human being. 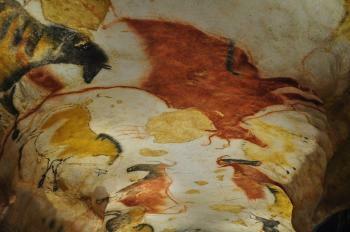 Art of Lascaux is beautiful, so it is natural that people around the world want to come here to visit Lascaux”. This is a site I had long wanted to visit, but it is rather difficult without your own transport. The solution was a well-organized day trip run by a tour company (Ophorus). Starting from the pretty medieval town of Sarlat, we first visited the cave of Rouffignac, which is especially famous for its fantastic paintings of mammoths. The visit is by means of an electric railway which stops at several points for an explanation of the paintings. It was already a tourist attraction in the 19th century, so it is remarkable that one can still visit the original cave, rather than a replica. The day continued with a guided visit of the excellent National Prehistory Museum in Les Eyzies de Tayac, which supposedly contains the largest collection of prehistoric artifacts in the world. In the afternoon, we joined a guided tour of the Lascaux II cave, the replica of the most famous cave in the world. The original was closed to visitors in 1963, and the replica opened in 1983, just about 200 metres above the original (the entrance to the original is of course closed off, but the UNESCO sign can be seen at the fence). Lascaux II recreates the most important parts of the original cave in immaculate detail and is really quite fascinating, although I have to say that I was even more impressed by the original cave in Rouffignac. I visited this great WHS in March 2014. I drove to the Vézère Valley early in the morning. There are prehistoric sites scattered all over the valley but most are either not open to the general public or else it is only possible to visit with a tour guide available only 2-4 times a day (especially in the low season, i.e. NOT June to August). After a lot of research over the internet, I decided to head first to Les-Eyzies-de-Tyack to visit the National Museum of Prehistory. This gave me a general overview and good insights on what to look out for and why these sites are so unique and important. Afterwards, I proceeded to Roc de Cazelle which turned out to be nothing more than caves with artificial scenes attempting to depict how prehistoric everyday life must have been in these caves. All in all it's not worth the effort and time to get there unless you travel with children. Next I visited Font-de-Gaume Decorated Cave which I had prebooked directly by email to fontdegaume@monuments-nationaux.fr. There is quite a hike to visit these caves which are high in the cliffs so my trekking shoes came in handy. The guided visit was 1 hour long. This cave contains around 180 paintings of animals, mainly bison and reindeer with different shades of black, red, brown and yellow. Since the cave has never been completely closed, the quality of the drawings is fading, even though only 200 visitors per day are allowed. After my visit, I asked the guide where I could visit to view some prehistoric etchings which are also mentioned in this inscription. The guide suggested a quick visit to both Les Combarelles Caves to view the prehistoric etchings of felines, stags and Rouffignac Cave which is mostly famous for the outline of a mammoth and which is definitely the site to visit if you only have time for only of these two. That was quite a good morning starter, so I headed towards quaint Montignac where I stopped for lunch. 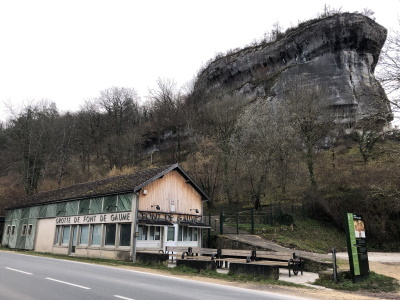 In the afternoon I drove to the entrance of the original Lascaux Cave which is now closed to the general public but there I found a UNESCO plaque depicting its inscription. It is only 200 metres uphill from the visitor centre of Lascaux II. Lascaux Cave contains some of the best-known Upper Paleolithic art estimated to be 17,300 years old. Discovered in 1940, the cave complex was opened to the public in 1948, but by 1955 the carbon dioxide exhaled by 1200 visitors per day had visibly damaged the paintings and the cave was closed to the public in 1963 in order to preserve the prehistoric art and restore it to its original state. Yet this turned this incredible site into a monitored and closed laboratory, with experts involved to fight against the fungi, black mold, green mold and preserve the pigments. Lascaux II, a replica of two of the cave halls (the Great Hall of the Bulls and the Painted Gallery) was opened in 1983, 200 meters from the original. It's truly a work of art and a replica not only of the prehistoric paintings but also the cave structure, lighting, climate, etc. The main difference is that the replica paintings are on a different surface when compared to the original and therefore should not be attacked by fungi or mold. The guided visit was only available in French since I went in the low season but the guide spoke slowly and described every single outline and drawing using a torch to indicate the painting she was describing. The painted gallery is really mind-boggling and is best viewed sitting or crouching down in the middle of the replica cave. That way I could really appreciate the great detail and point of view our prehistoric ancestors were capable of rendering. Although photography (even without flash) and filming is not allowed in all the sites I visited in the Vézère Valley, I still took my camera with me to try my luck in the main plate of my visit near Montignac, which definitely deserves to be inscribed for its OUV. Since I was the last one to try to exit from the replica cave and had to wait with the guide for a couple of minutes for the heavy rain to stop before exiting the cave, and after answering all my questions in detail, my guide asked me where I came from. I replied that I'm from Malta and after hinting at where that is on the globe, I tried my luck and asked her if it was possible to take a quick photo (without flash) of the cave to treasure when I return to my distant homeland. I was surprised that it worked and before she could think twice, I took some photos in quick succession in 2-3 seconds. I wasn't expecting much out of my attempt, but I was pleasantly surprised when I checked out my photos on my computer and I must say I'm more than happy :) The overall experience was very rewarding although quite expensive and to me it's one of the best WHS in France. To visit this site I travelled by train to Les Eyzies de Tyack where I visited an informative Pre-history museum. But earlier in the day I had located the Font de Gaume, a series of caves high on a cliff. I managed to get on the first tour of the day when during an hour long tour the guide showed us spectacular paintings of many different animals, but mostly bison and reindeer. I had wanted to reach the Lascaux caves, but there is an absence of transport in that part of the valley. In our trip to France we have visited four prehistoric sites but I was very disappointed by the fact that most of them were accessible only on booking or were closed. The valley, long 40 km and large 30 km, contain 147 sites and 25 decorated caves (15 are WHS). First we have been to the shelter of Cap Blanc, located in the lateral Beune valley, near Marquay. There are high-relieves of two bisons, horses and reindeer in a limestone cliff, also longer than 2 m, made by reindeer hunters more than 15000 years ago, and a human burial place. The cave of Rouffignac (or Cro-de-Granville), that was already known and described in the 16th century, is situated on a lateral valley along a tributary of the Vézère and has over 8 km of galleries. There were discovered in 1956 engravings and black-outlined paintings, especially in the Breuil gallery: 160 mammoths, 11 bisons, 11 goats, 9 horses, 7 rhinoceros, 1 bear and many other pictures. We have also seen, near Les-Eyzies-de-Tayac the deposit of Laugerie Basse, in a place called 'Les Marseilles', where were found many implements from the reindeer age and a cross-section shows stratified tiers of excavated human remains, and the Grand Roc, a cave with 40 km of passages leading to small chambers that contain stalactites and stalagmites. The cave of Rouffignac and the shelter of Cap Blanc are two of the most beautiful places I have ever seen, because of the beauty and antiquity of the prehistoric paintings and sculptures, that I have seen here for the first and only time. But I was quite disappointed by the shelter of Laugerie Basse and the cave Grand Roc, that are more natural that cultural places. I didn't like also the fact that many of the other prehistoric places are visitable only on booking of guided tours and that if you go at La Magdaleine you can see only the medieval troglodytic village and not the nearby famous prehistoric site, that I wanted to see. The sites are absolutely worth to be visited because they are the most beautiful prehistoric places in the world and justify the inscription, also because there aren't many prehistoric sites inscribed on the WHL, even if some prehistoric places of the valley could be excuded from the WHL and others included. From "Decorated Grottoes of the Vézère Valley" to "Prehistoric Sites and Decorated Caves of the Vézère Valley"
Mammoths: Cro de Granville (cro de Rouffignac) - depictions of 158 mammoths, i.e. 70% of all represented animals. "Cave Man" sites: "contains 147 prehistoric sites dating from the Palaeolithic and 25 decorated caves. 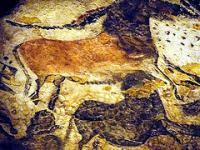 It is particularly interesting from an ethnological and anthropological, as well as an aesthetic point of view because of its cave paintings, especially those of the Lascaux Cave, whose discovery in 1940 was of great importance for the history of prehistoric art." Not open to tourists: Lascaux Cave has been closed since 1963; there is a replica available and also there are other inscribed caves that can be visited.